THE club’s fortnightly twilight meeting at the Red Lion Hotel took place on Tuesday last week when a good attendance of Rotarians heard another of the “job” talks from the newer crop of members. The latest contributor was Hilary Shaw, who is the club’s vice-president and expects to succeed the current president-elect Barry Prior as president during the year 2020/21. Hilary spent her formative years in Lancashire, travelling south to study for a degree in physics and computing at the University of London. On graduating, she started working at Ferranti Computer Systems as a software engineer, where code was created on paper tape. Not wanting to be pigeon-holed into specific software, she moved to Fisher Price Toys where she worked as a programmer/analyst on distribution and sales software. An early code generator was trialled but the code that the computer generated was not as elegant as that of a human! Hilary then joined Perpetual in Henley in a small IT department of just five people. This proved to be the right place at the right time for her and she enjoyed the challenge of the various jobs as the company grew, rapidly aided by the launch of PEPs which provided a tax wrapper for the Perpetual investment funds. After a number of years, Martyn Arbib sold the business to Invesco and Hilary worked on migration and merging software systems during the integration process of the two companies. Members were then invited to toast the finalisation this month of the renaming of Invesco Perpetual to Invesco. For this, Hilary provided her own wine, as one of her hobbies is wine making, and she challenged her audience to guess whether it was home-brewed or purchased. Following a number of contracts and jobs in IT, projects and compliance-related work, as well as an operation on her hip, Hilary decided it was time to go back to her roots. She had always had great respect for animals and had kept a menagerie of pets as a child, having acquired two guinea pigs on her seventh birthday. The visiting dogs generally get walked twice a day on the Ridgeway and in the Chiltern hills. In thanking Hilary, president Peter Thomson joked that his and Barry Prior’s presidential years would be sandwiched between those of “cat woman” and “dog lady”. 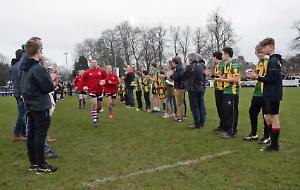 Secretary Philip Fletcher announced arrangements for club members to assist with shepherding players at last Sunday’s festival of rugby, hosted by the mini section of Henley Rugby Club.